You can see me demo this recipe on KATU AM Northwest here! What is a celebration of Mothers without cake? I don’t even need to answer that, it seems like a redundant question, there should always be cake. This is an easy cake to make, beautifully simple, yummy, and no special equipment necessary cake. That is just one of the many things I love about oil cakes. While creaming butter and sugar can be therapeutic in its own right, the simplicity of the process in an oil cake is addicting. On the flip side, olive oil gives a deep richness, a unique flavor that is just not possible with other oils. Making citrus olive oil cake for Mothers Day seemed like a perfect match. Adding mango, well that just made sense. It’s sweet, in season, and pairs perfectly with citrus and olive oil. The other lovely plus is that this takes very little time to make, maybe twenty minutes at most to get this in the oven. You could also make this one day ahead of time, it keeps at room temperature very well over night. And is great for a brunch, because it isn’t too rich or heavy. It may take about 15 minutes to make the design of that is the way you choose to go, so give yourself plenty of time for decorating. 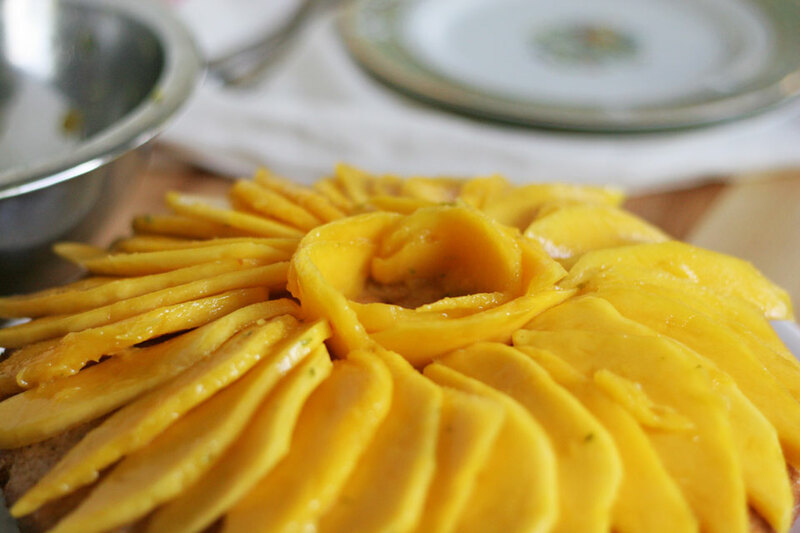 If not, pile the mango on top to serve, it will be just as tasty, and pretty! No stress desserts ok! Note: Zest the citrus first, and then juice. You’ll need 1/4 cup citrus juice total. Note: You can use a 9×2 cake pan, or a 9 inch cast iron skillet. 1. Pour one teaspoon olive oil into a cake pan, use a paper towel to spread and coat the pan. In a large bowl add the flour, baking powder, baking soda, and salt, whisk to combine. In a small bowl, add the sugar and zest, rub together. Combine the milk and citrus juice together, using a fork, whisk to combine, set aside for 5 minutes to make buttermilk. 2. Add the eggs, and olive oil to the buttermilk, whisk to combine. Add the buttermilk mixture to the flour mixture. Using a spatula, gently mix to combine. DO NOT OVER MIX. Mix until the flour is barely combined with the buttermilk. Place the mixture in the cake pan, and place in the oven for 35 minutes. 3. 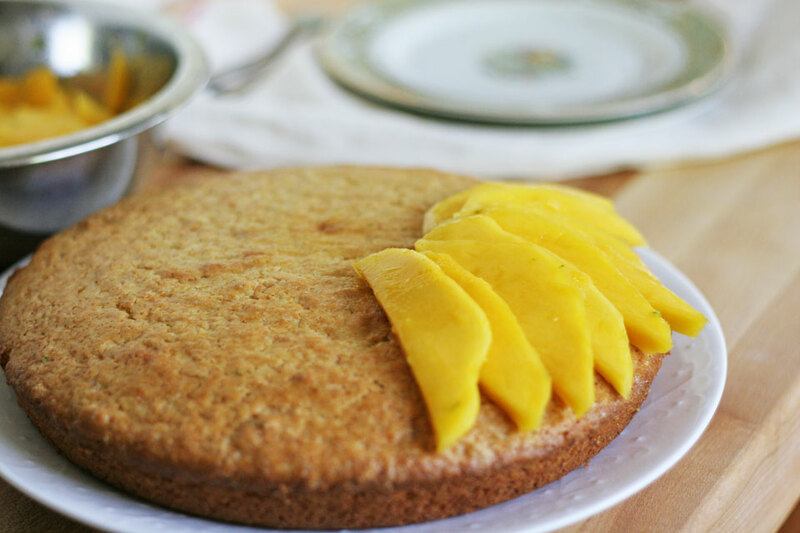 While the cake bakes work on the mangoes. Peel the mango first. Then cut each side off of the seed. Place face down, and slice 1/4 inch slices. In a medium bowl, place the reserved 1 teaspoon lime juice, 1/2 teaspoon lime zest, and 1 teaspoon sugar, mix. 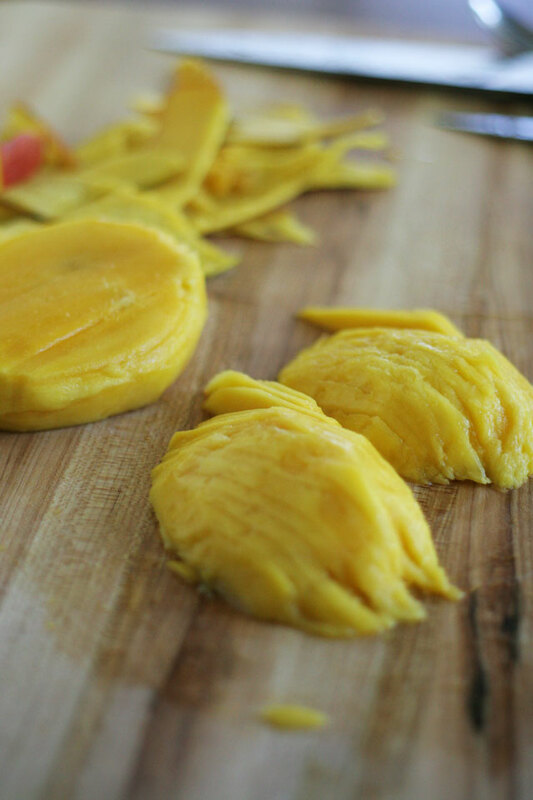 Add the mangoes, using your hand or a rubber spatula, gently toss to combine. 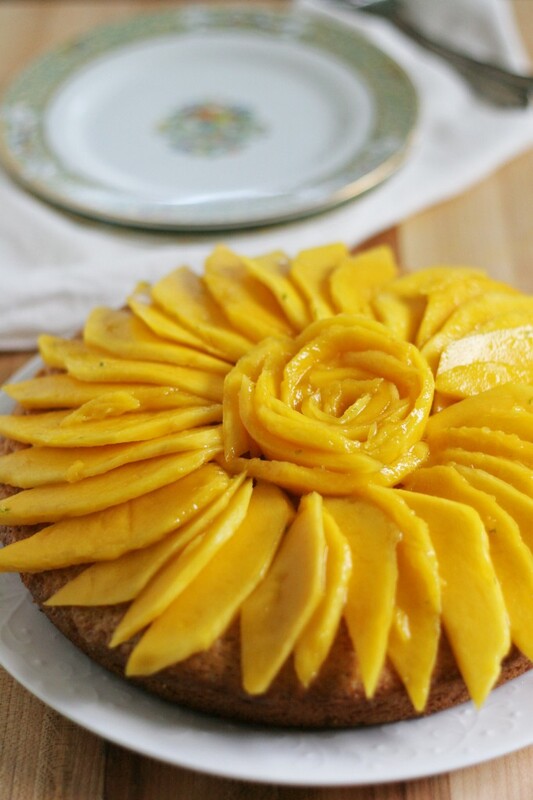 Or you can make a huge pile of beautiful and delicious mangoes in the center of the cake and slice to serve. It will look pretty either way! Enjoy and Happy Mothers Day!